BCCSU > Uncategorized > Can we reduce drug-related harm by changing how and when income assistance is distributed? On the last Wednesday of every month, Vancouver’s Downtown Eastside is filled with an energy unlike other days of the month. It’s cheque day, the one day each month when income assistance is delivered. Lineups outside Pigeon Park Savings are followed by lineups inside grocery stores and the Army & Navy. Distressingly, drug use and related harm like overdoses and emergency room visits also increase drastically in the wake of cheque day. This day impacts not only those who rely on income assistance, but also those who provide services in the neighbourhood. It’s probably no surprise then that when we invited community stakeholders to a forum to discuss how income assistance is delivered, we found ourselves in front of a packed house of local service providers, community members, and business leaders. This event was part of an ongoing community consultation we are doing alongside the Cheque Day Study, both of which are being done to help understand how the system can be improved. 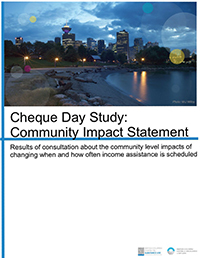 The Cheque Day Study is looking at whether changing payment timing and frequency would decrease drug-use and related harm. The study has been underway for just over two years, and we are learning a lot about whether and how and these different schedules work for people. 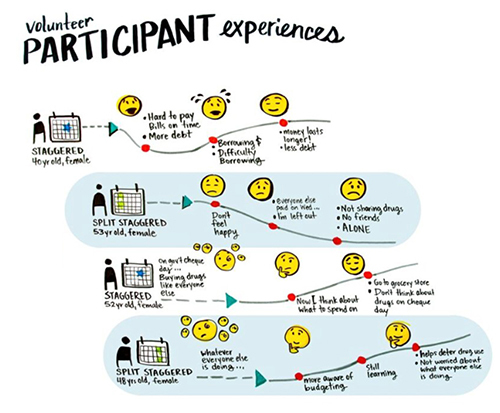 As we learn about how and when these different schedules work for people receiving income assistance, we also want to think about ways that the wider community might be impacted by a change. To do this, we are inviting feedback from people who know the community well, who are either receiving income assistance or providing support for those who are. We will be putting together a Community Impact Statement from what we hear, to share alongside study results when policy changes are being considered further down the road. We were very fortunate to have a graphic recorder join us who created these images to capture some of the discussion. 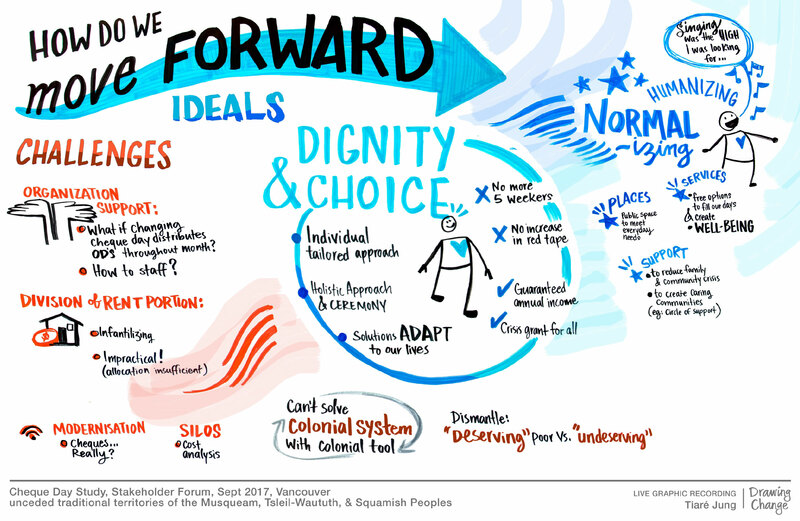 Our discussion focussed on how an ideal system would be one with dignity that would be flexible to fit people’s lives. 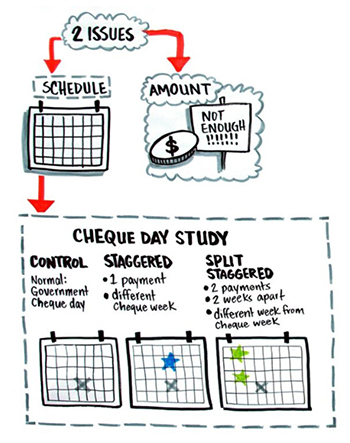 We also heard about ways that people could be better supported around cheque day, and what it might mean for organizations if people were paid differently. Changing the way income assistance payment are schedule has the potential for cascading impacts within the community. To fully understand these impacts, we will continue to engage with those who would be impacted by a change. This valuable insight and experience from stakeholders will be instrumental in ensuring this research makes recommendations that align with community priorities and support health for people receiving income assistance. If you would like to learn more about the study, or provide your feedback please get in touch with Joanna Mendell, the study’s Knowledge Broker jmendell@cfenet.ubc.ca. The Cheque Day Study is led by Dr. Lindsey Richardson from UBC and the BC Centre on Substance Use. More information about the study can be found here.